I've recently come to the realization that many of my non-essential expenditures are focused on preventing boredom. Whether that's trying out new restaurants, collecting vintage cameras, or buying crafting supplies, hobbies can get surprisingly expensive. Fortunately, there are many hobbies that allow you to occupy your leisure time without racking up huge bills at the end of the month. 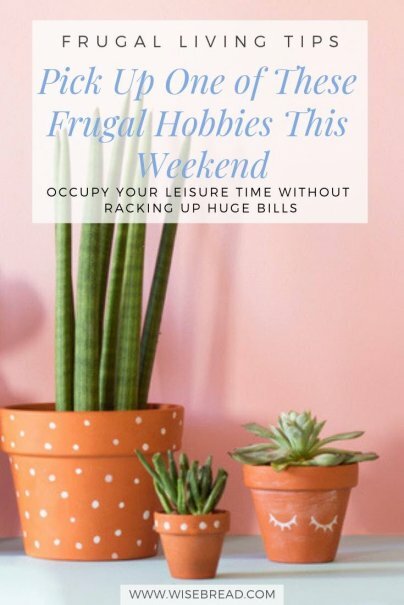 My goal is to replace my less frugal hobbies with some of these inexpensive alternatives and I encourage you to do the same. Succulents are the perfect plant for a beginner gardener with a black thumb, like me. The only really bad thing you can do is overwater them. And while gardening in general is quite frugal (as long as you start from seeds and don't go crazy at the local nursery), succulent gardening is even more so. You never need to actually buy a succulent. They propagate themselves easily from cuttings begged, borrowed, or stolen (just kidding, NOT stolen!) from friends and family. All you need are some pots with good drainage (look for them at thrift stores to keep costs down) and some soil. Cooking your way through a cookbook or, alternatively, a cuisine, can be a way to get your creative juices flowing, while avoiding eating out. Instead of becoming a "restaurant foodie," which can get expensive, become a "home gourmet foodie." When I first got married, I decided to learn to cook all of the American classics, from chili con carne to classic pot roast. I gave myself a free course in cooking as well as saved us money we would have otherwise spent on restaurants. To keep this hobby frugal, and look for accessible, down-to-earth cookbooks or food blogs. Instead of trolling the aisles of Target and picking up various knick-knacks you don't need, why not start browsing the aisles of your local thrift store instead? The thrill of finding something unique and awesome for $2 is just incomparable. True, it might not be something you need, but if you're going to shop anyway, at least you're only paying a fraction of the price. And if you find some cool stuff, you can always sell it on eBay or Etsy. Origami, the art of folding paper into creatures and shapes, is a wonderfully frugal hobby. All you need are some squares of paper, which you can cut from scrap paper, or you can buy a pack of colored origami paper for a very reasonable price. Check out YouTube videos and online tutorials to start learning. Running is one of the cheapest forms of exercise. You don't need a gym membership or any fancy gear except for a pair of running shoes. Get some friends together to make things more fun. Your health (and your wallet) will thank you. A pack of yarn from your local craft store will only set you back a few dollars and can occupy you productively for several hours. It's therapeutic to have something to show for your hard work, and maybe you can even save money on birthday presents by making knitted or crocheted headbands, hats, and other cute creations for your friends. Check out the local outdoor hiking trails in your area. Exploring the outdoors can be a great way to get some exercise and entertainment at the same time. Look for local wildlife and learn to recognize local plants, using free resources from the Internet or borrowed books from the library, as well as local nature centers. If you need more of a challenge, try geocaching — a kind of global scavenger hunt where you download GPS coordinates and enter them into a GPS device (an app on your smartphone, if you already have one). You then head out into the outdoors to find the cache, where you add your name to the cache's log once you find it (and sometimes find other treasures too). Reading can be free if you have a library card. Many libraries also offer ebooks for free — you can download and keep it for two or three weeks and then "return" the ebook. If you don't like going to the library (or if it takes you several months to get through a book), many classic novels are available for free on Amazon. Language skills will serve you well in the professional world, and it's also a fun pastime that can open the door to new friends and cultural opportunities. There are many free language resources on the Internet, such as Duolingo, LiveMocha, and more. If you enjoy crafting but don't want to spend the money on craft supplies, upcycling might be for you. A simple search on Pinterest reveals a myriad of ways to turn your trash into treasure, from melting down old candles to make new ones, to turning old t-shirts into rugs and tote bags, and sweaters into pillows and mug cozies. Get your thoughts out into a journal or blog. You can write about anything: your daily life, your cat's escapades, your personal poetry, or stories about your life. You could even turn this into a paying side gig — I started out writing descriptions of my travels and ended up writing for this blog! What hobbies do you like doing in your spare time that don't cost anything? Love these reminders! I already practice many of these suggestions and you have reinforced my resolve. I would add exploring vegetarian cooking to #2. Great article! Not sure if this counts; I DID have to buy the bike in the first place, but riding costs nothing! PS: I LOOOOOVE the idea of cooking my way through a cookbook! Even one new recipe a week would be great, and depending upon what kinds of friends one has, it could be a group thing. I run or jog for exercise instead of going to a gym..it has saved me money, helped me lose weight, and improved my blood pressure. I also cook a lot at home with recipes I get off the Internet or from one of my thrift store cookbook finds. I also read a lot and get secondhand books or borrow from book swaps or the library. In the past, I did some crocheting, but would like to learn how to knit better. My twelve year old son is great at origami which he learned from you tube videos. He loves arts and crafts and is very creative about using recycled materials for his projects!